Please join us for the Deer Path Art League’s 64th Annual Art Fair on the Square held in beautiful historic Market Square in downtown Lake Forest, Illinois. The community of Lake Forest is located 30 miles north of Chicago. This festival is a highly rated, well-attended event of long standing. Art Fair on the Square is the Art League’s signature event and helps us fulfill our mission to bring high quality visual arts to the community. Sunday September 1 & Monday September 2, 10am—5pm both days. Join us for the Deer Path Art League’s Annual Art Fair on the Square held in beautiful historic Market Square in Lake Forest, Illinois. This festival is a highly rated, well-attended event of long standing. Art Fair on the Square is the Art League’s signature event. The funds raised from booth fees and sponsorships help us fulfill our mission to bring the visual arts to the community. This prospectus provides basic information, rules and requirements regarding the festival. Additional information will be sent to artists upon acceptance into the art fair. Monitary Awards will be given to artists in each catagory, two special memorial awards the Dorothy Burgert Photography Award and the Anne Flynn Memorial Award, and Best in Show award determined by the judges. Any artist found in violation of show rules will not be eligible for awards or re-invitation. Award winning artists are automatically invited back to the show the following year and will exempt from the jurying process, are required to register on Zapplication.org. A panel of three jurors selects the show in a “blind jurying” process. The identities of artists are not disclosed to the jurors. The three jurors will view all of the artist’s images at the same time and in the same room. Out of a total of 180 spaces, approximately 50 will be reserved for past award winners and artists selected by an on-site jury at the previous year’s show. Notifications will be by e-mail and the Zapplication site on or before April 15th. A limited number of corner booths will be available for an additional fee of $100. Corner booth selection will be made based on the date applications are received. First priority for corner booths will be given to returning artists. Additional details will be included with acceptance notification. Booth fee payment is due by April 29, 2019. Booth fees received from accepted artists are non refundable. Artists may forfeit their space if they fail to meet the registration deadline of April 29, 2019. Artists retain all proceeds from their sales. Lake County sales tax is 7.5% and must be collected and reported by artists. The Deer Path Art League assumes no responsibility in this matter. Please read and comply with all rules and requirements to avoid disqualification. 1. Open to artists 18 years of age and over. 2. Each artist will be limited to a single entry in a single media category. 3. The work exhibited must be consistent with the images submitted. 4. Artists must be present throughout the festival to exhibit. No spouses or other representatives will be permitted in place of the artist. YOU WILL BE ASKED TO PRESENT A PHOTO ID BEFORE PROCEEDING TO YOUR SPACE TO SET UP. 5. Exhibiting artists are required to display an Artist Statement in a prominent place within their booths. 6. Collaborating artists are permitted provided it is a true hands-on artistic collaboration. Collaborators are not “assistants” in the process and both must agree to the rules set forth by the Deer Path Art League and include the collaborator’s name in the application. Collaborators must be present throughout the entire festival. 7. All work must be created by the exhibiting artist. Commercially cast jewelry, kits, patterns, clay molds, or work done in production studios are not permitted. 8. Photographers are encouraged to do their own printing. Their creative and printing process must be disclosed in the Artist Statement. The photography category includes hand colored, Polaroid transfers, emulsion transfers, etc. ; do not enter such work in the Mixed Media category. Photographs made with digital cameras should be entered in the Photography category not in the Digital Art Category. The Photography category includes both optically (enlarger) and digitally printed images. All photographs must be hand signed by the artist. 9. If a one of a kind work of art, such as a painting, already exists and is copied by digital or photographic means and printed on an offset press, a serigraph press or through a computer by means of an ink jet or electrostatic printer, this would constitute a reproduction. This includes giclées and reproductions that are hand colored. Reproductions must be labeled, signed, and numbered as part of a limited edition. Reproductions should be unframed and displayed in browse bins. Only original artwork may be framed and displayed on the walls of the booth. Artist may only display work in the category in which they were accepted. For example, if an artist is juried in for oil painting, they may not exhibit watercolor, acrylic, or other mediums in their booth. 10. Artists must define reproduction or limited edition in their Artist Statement and disclose this information on the individual piece. 11. The Digital Art category includes any original work for which the original image, or the manipulation of other source material, was executed by the artist using a computer using software based painting, drawing, rendering, or illustration programs. Work in this category must be in limited editions, signed and numbered on archival quality materials. 12. Only artists accepted in the Jewelry category may exhibit or sell jewelry; all jewelry, regardless of materials, must be entered in one of the jewelry categories. No studio production work is allowed. 13. Artists may only exhibit and sell work in the medium in which they were accepted. 14. Sale of promotional items such as postcards and note cards is not permitted. No buy/sell or commercially produced products not made by the artist are permitted. 15. It is the artist’s responsibility to identify the medium for which they would like to be juried. Please choose the medium which best describes your work. If you do not choose a medium your application will not be processed. 16. The Deer Path Art League reserves the right to remove an artist who is in violation of our rules. Artists violating any show rules will be ineligible to participate in the art show for the following three years. 17. An Accepted artist who fails to appear without sufficient notice will be considered a “No Show” and will be ineligible to apply to Art Fair on the Square the following year. Artists must check in by 8:00 AM on Sunday; after that time empty spaces will be given to artists who are waiting, on a first come first served basis. 1. To be juried, each artist must submit four images. Three images showing one artwork per image unless multiple items constitute a suite (e.g., table and chairs, necklace and earrings). No split images or images within images. The fourth image should show your fully stocked booth display outdoors. 2. There should be no identifying names or people in your images and no text included in the image unless it is an integral part of the artwork. Individual booth assignments are made to create an appealing mix of media. Assignments are at the sole discretion of the Deer Path Art League and are not interchangeable or transferable; each artist is assigned a 10 x 10 space. Priority for booth assignments is given to the re-invited artists. Booths not assigned to re-invited artists are assigned first-come, first served based on when booth fees are received. Double booths are not allowed. 1. A consistent display must be maintained throughout the Festival and artists must supply their own 10’ by 10’ white canopy tents. 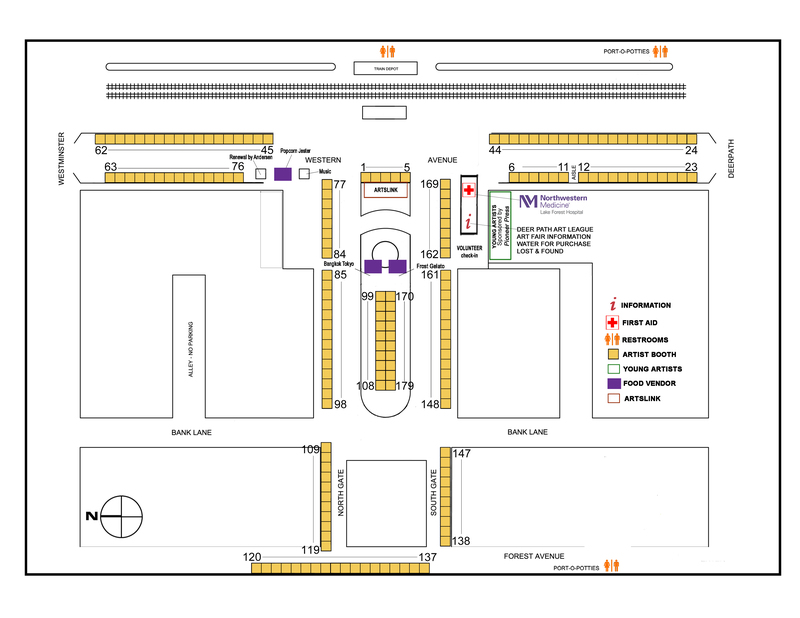 Exhibit spaces are 10’ x 10’ and are on either asphalt or grass surfaces. Absolutely no staking or drilling is allowed; double booths are not available. The Deer Path Art League expects that artists’ displays will be of the highest quality and will meet the standards inherent to a major, award-winning art festival. 2. Display may not extend beyond booth space. Browse bins must be aesthetically pleasing, and may not obstruct traffic flow or sidewalks. Racks, bins or other display elements may not be placed outside of the Artist's space so as to restrict or impede pedestrian traffic. No demonstrating in booths, including musical instruments. These requirements will be enforced for reasons of safety and crowd control, at the discretion of the Deer Path Art League committee. Electricity is not available and no generators are allowed at the festival. 3. Only the type of art that was displayed in your jury slides may be exhibited. Slides should represent current work. 4. Exhibitors are required to display an Artist Statement in their booth during the art fair. The Artist Statement should be printed on 8.5 by 11 paper. The Statement should include a description of the artistic process and materials used. It is a requirement of the show rules that the Artist Statement be prominently displayed in the artist’s booth during the fair. Artist without statements will be ineligible for awards or re-invitation. I have read the information contained in this application and agree to abide by the rules and regulations described and to be present with my work during the entire festival. I hereby certify that this work is original, hand crafted, one-of-a-kind design made by me. I agree to hold harmless the Deer Path Art League, the art fair committee, the City of Lake Forest, and all persons or agents affiliated with or employed by the aforementioned organizations, on behalf of myself and my assigns and heirs and from any and all claims, which may result from my participation in the festival or selection. The Deer Path Art League has permission to publish images and/or photographs of my work, my booth, or of me for purposes related to the promotion or history of the festival, past, present, or future. I understand that the Deer Path Art League reserves the right to refuse any application for any reason and without comment.